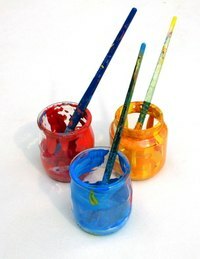 Acrylic paint is a plastic-based paint. The advantage of using acrylic paint is that the drying time is considerably less than oil-based paint. Because of the fast drying properties, the paint also tends to dry on the inside rims of the jars and cans. It can be a frustrating problem when the paint dries on the inside of the lid making the containers difficult to open. There are solutions to this problem. Grasp your jar and, with the handle of your screwdriver, tap the rim of the lid going all the way around it. This will help crack the seal of the dried paint. Do not worry if you dent the lid. If the jar still will not open, proceed to step 2. Turn on the hot water in your sink. Carefully hold the jar under the faucet so the water is running over the lid but not your fingers or hands. The hot water will soften the dried paint and loosen the seal so that you can open the jar. It may take a few minutes for this to work. Shut the water off and place the washcloth over the lid. This will protect your fingers from the hot lid. Firmly grasp the cloth and try turning the lid counter-clockwise. If you still cannot open it, repeat steps 2 and 3. When storing your paint, apply a little petroleum jelly to the inside rim of the lid to prevent the lid from sticking to the paint. Do not use a wrench to force the lid to turn. You can break the bottle and spill the paint. Be very careful not to get your hands or fingers under the hot water. This can cause serious burns. Grasping the hot lid without the washcloth can also cause burns.